I ran across this today when importing a DXF file from a vendor. I’m not quite sure how long it has been there, but this is the first time I have noticed it. 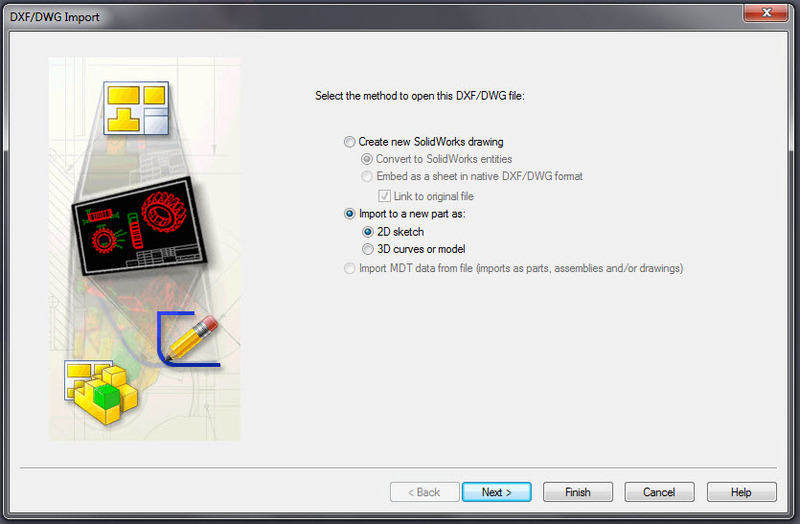 When importing a DXF/DWG file you are presented in an import wizard with many options. The first screen is shown below. 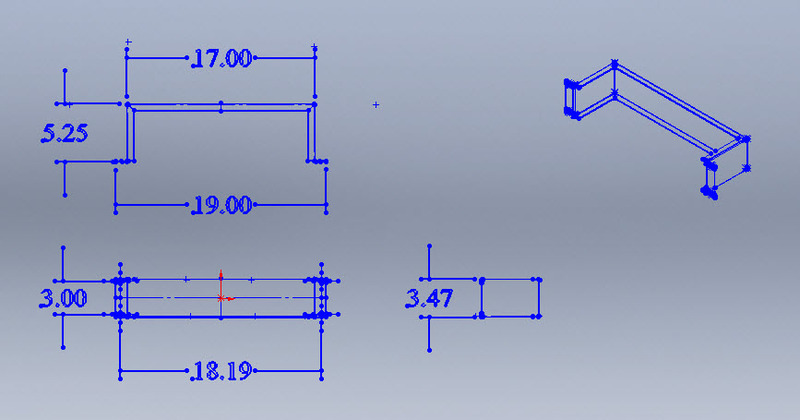 In this case, I chose the “Import to a new part as: 2D sketch” option. Once you click next you come to a screen with an interesting new option. In instances like the example shown above, the origin of the file is located far away from the geometry. There is now a “Define Sketch Origin” option that allows you to place the Sketch origin in a different location rather than the 2D file origin. You can use the view options to zoom in tight to the point on the model where you would like to place the sketch origin. This would be a REALLY cool option if it was able to employ ESNAPs, but for now it doesn’t. 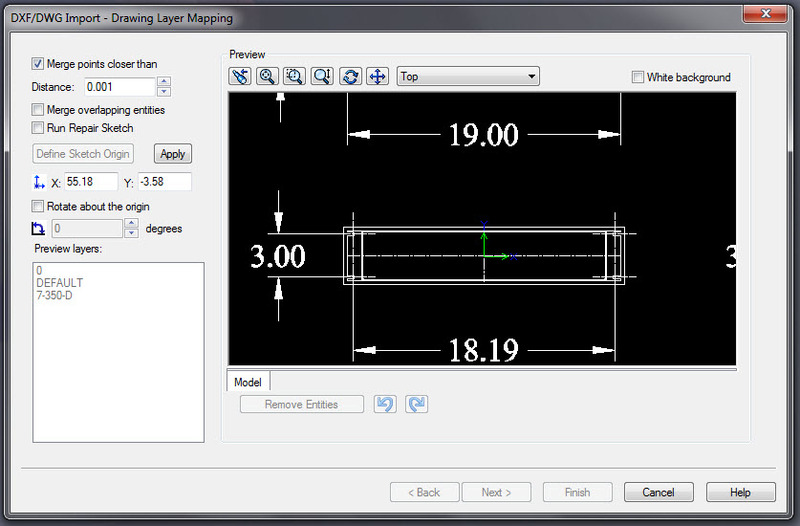 Still this can save a sometimes necessary step before importing the geometry. Below is an example of placing the Sketch Origin in a different location. That’s all for now…stay tuned…more to come! 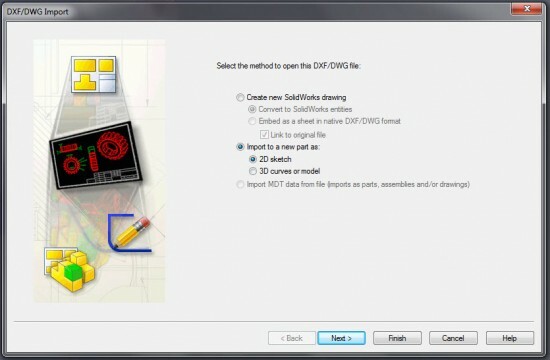 New Modeling Tool at SolidWorks Labs! Experience SolidWorks World – FOR FREE! In 2010 there isn´t this option. Ahhh…So it is a new option then for 2011. After reading your comment I went back and looked in the 2011 What’s New Guide and it is mentioned on page 79. Thanks for pointing this out Gale. Thanks. I got another question. 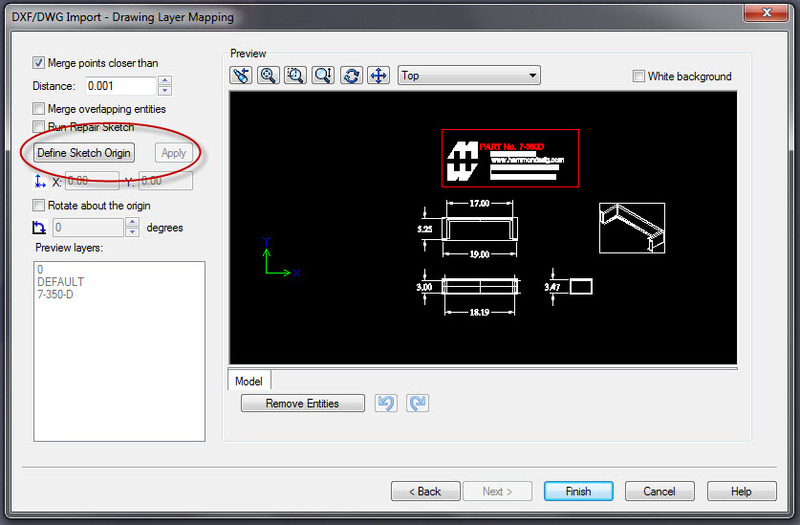 When exporting dxf/dwg from drawing, how to let the origin of dxf/dwg being the same as a certain point on the model? It seems the default location is allways the left lower point of the drawing frame. Oh.numbers and all this technical thing ,it’s difficult for me to understand. Ricky Jordan's Blog by Ricky Jordan is licensed under a Creative Commons Attribution-Noncommercial-No Derivative Works 3.0 United States License. Permissions beyond the scope of this license may be available at http://www.rickyjordan.com. I am in occasional contact with employees at DS SolidWorks Corp and am sometimes asked to provide feedback on new products or programs. I am not compensated for these efforts. DS SolidWorks Corp paid for my travel, accommodations, and some meals for the SolidWorks World 2013 event & some SolidWorks Press Events. Copyright © 2011 - Ricky Jordan’s Blog. 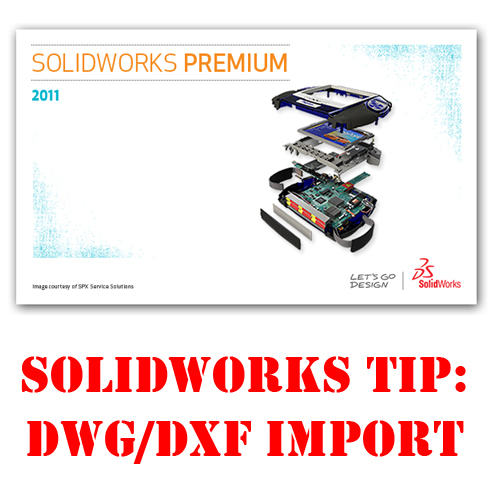 SolidWorks, The CAD Industry, & More!.